An Indiana Jones style treasure hunter is the star of Jungle Jim El Dorado, a 5 reel, 25 payline video slot powered by Microgaming. Helping our intrepid 3D adventurer on his (and your) quest for gold are tumbling reels with multipliers and free spins with even bigger multipliers trails that can top 15x. Start your trek from between 25p and £25 per spin. Jungle Jim El Dorado is very well presented – set against a tropical, vegetation heavy backdrop, amid the ruins of an ancient temple, the reels include a range of gemstones, idols, burial masks and chests full of treasure. The images are done 3D style and look bang up to date. The game is played using a Rolling Reels feature – after every winning spin, the successful symbols are blasted away and replaced by the symbols directly above. A new payout consideration is made with the new symbols in place. These continue until there’s a symbol drop where no winning combination is on view. Even better is the fact that the symbol drop wins come with an expanding multiplier that increases by 1 with each successive win. This means you can boost your payouts by up to 5x. Even bigger potential rewards are on offer in the Free Spins feature – to trigger it, you’ll need to land the scatter symbol on reels 1, 2 and 3. You’ll be given 10 free spins which take place on a new set of reels situated within a treasure filled temple. The rolling reels are in play during the free spins too with even bigger multiplier awards on offer for successive wins. These boost your payouts by 3x, 6x, 9x, 12x and 15x! Land the scatters during the feature and you’ll trigger another batch of 10 free spins giving you 20 in total. 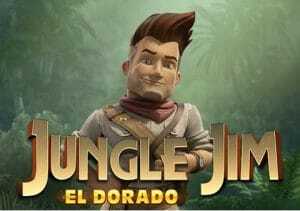 Jungle Jim El Dorado is a medium volatility slot – it offers fairly regular payouts but also a shot at bagging something big. This rainforest adventure is a very well designed affair. It looks and sounds terrific. The range of features isn’t huge but the rolling reels keep the action flowing along very tidily. Throw in the multipliers and a quality free spins round and this jungle trek can turn into pure gold. If you like the theme, I recommend you try NetEnt’s Gonzo’s Quest.